With the launch of the 2013 Scion FR-S this week, dealers may have to cut their markups on the Subaru BRZ as the Toyota sports car hits showrooms. As we reported here in April, demand for the 2013 Subaru BRZ was allowing many dealers to mark up the rear-wheel-drive sports car as much as $5,000 over the MSRP. Because they are in limited supply, buyers who wanted the popular sports car from Subaru had to pay that amount. As reported by Drive On, their online research showed a typical markup of $2,000 was common in many dealerships. But that could all be changing with the launch of the 2013 Scion FR-S earlier this week. Because the two cars along with the Toyota GT 86 were developed in a joint partnership between the two Japanese automakers, they are very similar, and buyers now have another good choice. With Toyota announcing that the FR-S is available in dealerships nationwide, it will be interesting to see if buyers of the Subaru BRZ will drive down the street to the Scion dealer. Scion dealers have already seen a rise in buyer interest for the new sports car. Scion Vice President Jack Hollis said, “The incredibly positive buzz surrounding the FR-S has generated an impressive list of hand-raisers and pre-sold orders.” It shouldn’t be a surprise that the 2013 Scion FR-S will be an immediate hit because of the demand for the Subaru BRZ. Toyota and Subaru have provided an authentic sports car at an affordable price. After the development of the car was underway, Subaru did the engineering and development of the chassis and powertrain, and Toyota handled the design. The 2013 Scion FR-S comes with a 2.0-liter naturally aspirated boxer four-cylinder engine producing 200 horsepower and 151 lb. ft. of torque. The Subaru boxer engine incorporates Toyota’s cutting-edge D-4S direct and port injection that comes from the Lexus IS F.
Because the FR-S uses the Subaru boxer engine, it sits low and farther back in the chassis which keeps the center of gravity as low as possible which is ideal for a sports car. The design gives the car a dynamically favorable front-to-rear weight ratio of 53:47 and a low center of gravity comparable to some exotic supercars. The car weighs just 2,800 pounds and utilizes an aluminum hood to save weight. Underneath, the FR-S gets a sport tuned suspension which utilizes MacPherson struts up front and a double wishbone system in the rear for spirited driving through the corners. Lightweight 17x7-inch alloy wheels and ventilated disc brakes are standard on all four corners. The new rear-wheel-drive Scion FR-S starts at $24,200 with a six-speed manual transmission and $25,300 with the automatic. The BRZ comes with more standard features and starts at $25,495 for the Premium model and $27,495 for the Limited. But that’s without the $2,000-$5,000 dealer markups. 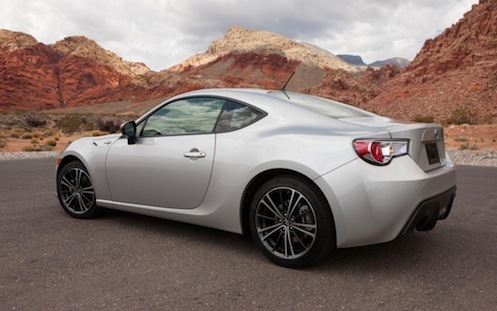 With the launch of the Scion FR-S Subaru dealers may be more inclined to stick with the MSRP. Inside, the Scion FR-S sports 2+2 seating with fold down rear seats for maximum cargo carrying capability. A leather-trimmed steering wheel is standard and has both tilt and telescopic adjustment. The FR-S comes standard with features like an eight-speaker AM/FM/CD/USB 300-watt Pioneer audio system, HD Radio and Bluetooth connectivity.Toyota says the FR-S will be the first Scion to offer a connected multimedia audio system called BeSpoke, powered by Pioneer’s Zypr. When connected to an iPhone, BeSpoke will offer a higher level of connectivity features and personalized content like Facebook, Twitter, and Internet radio. Subaru dealers don’t have the corner on the market any longer with the launch of the 2013 Scion FR-S this week. Buyers have another choice of a fun rear-drive affordable sports car. Why are these cars exactly the same since subaru and Toyota don't work together?